You are the leader of a growing galactic empire. 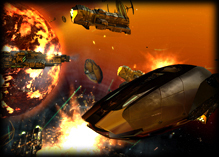 n Sins of a Solar Empire, you are the leader of a civilization embroiled in a galactic war, fighting for the survival of your entire race against relentless foes. Your success will depend entirely on your ability to manage your empire and command your vast fleets of starships to victory. A game of Sins of a Solar Empire can range from as few as seven planets to as many as 130 across five different solar systems. Travel to new worlds via phase lanes - interplanetary and interstellar highways that connect the all the stars, planets, asteroids and more. Send scouts to discover new lanes and new territory to conquer. As you grow in power, you can also research new technology to help find distant worlds and detect the movements of enemy fleets from afar. As you discover new territory to acquire, you must expand and claim it as quickly as possible, before other empires do so. Add asteroids rich in resources to your ever-growing empire through military conquest, or wrest control of them from neutral factions. An expanding empire requires resources to power its war machine and economy. Sins of a Solar Empire uses three primary resources: Metal, Crystal and Credits. Improving your planets and building new structures in orbit will help you to maximize your income and your ability to support larger fleets of ships. Eventually your empire’s borders will be threatened by an opposing power, blocking further expansion. Faced with this situation, you have three choices available to you: run and hide behind your fortified worlds, take the offense and strike before the enemy, or try for a diplomatic solution. 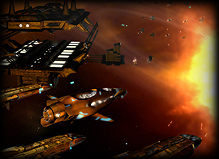 At its core, Sins of a Solar Empire is a game of interstellar war. While you may be able to ally with some, ultimate victory will only be achieved when your foes lie broken and defeated! In order to achieve these goals you must first master managing your empire and fleets. Construct new cities and operations centers on your planets to increase tax income, support more orbital structures, and harden your world against aggressors. Shipyards, research stations, resource extractors and other facilities are amongst your most important buildings and key to powering your war machine. Spread your ideals by broadcasting your culture to nearby planets to strengthen your own people and inform opponents of the futility of their beliefs. Grow your economy by building trade ports and resource refineries to increase the income across your empire or with neighboring powers. Your ships cannot be everywhere at once, so deploy defensive platforms, mine fields, hangar bays and powerful starbases to protect your assets. Create choke points in the phase lane network to secure and protect your planets from enemy fleets. Research Advanced Technology Improve your ships’ weapons, unlock more advanced vessels and structures, discover new ways to exploit your resources and become a diplomatic power by investing in technology research. A player who effectively manages the technology tree will be a force to be reckoned with on the battlefield! 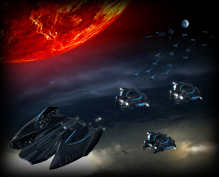 Build fleets of capital ships, cruisers, frigates and support vessels to ravage enemy defenses and planets. Manage your ships in battle, or let your commanders control the action, to obliterate enemy forces and fight your way to victory. Only through careful use of combined arms will you be able to defeat your foes. 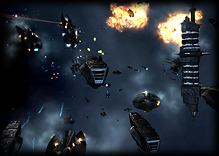 As your capital ships and titans fight, their crews gain valuable combat experience, and as they grow more battle-hardened, they will learn new and cunning techniques to further improve their effectiveness in battle. These are your most prized asset in any fleet. *Titans are a Rebellion-only feature.